Nina Davuluri, Miss New York, was crowned the new Miss America on Sunday night in Atlantic City, New Jersey. Miss New York, the second Miss America winner from her state in the past two years, gracefully proves that pageant contestants needn't worry about onstage flubs, as she missed her cue during the talent competition earlier in the evening. Miss America contestants this year ranged from a tattooed Army sergeant to a woman born without part of her arm. ATLANTIC CITY, N.J. (AP) -- Nina Davuluri became the second consecutive contestant from New York to win the Miss America pageant. 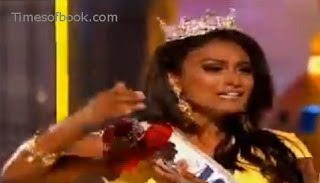 Davuluri won the title as the nationally televised pageant returned home to Atlantic City. She succeeds another Miss New York, Mallory Hagan, whose tenure was cut short when the pageant moved back to Atlantic City after a six-year stint in Las Vegas, where winners were chosen in January. Davuluri performed a classical Bollywood fusion dance for her talent competition. She is the first winner of Indian descent. Nina Davuluri was 24 years old. She Wins Miss America 2014 Title and already she won the title Miss New York for the year of 2013. She is the first Indian American to be chosen to be Miss America. Davuluri was born in Syracuse, but moved to Oklahoma at age four then to Michigan at 10. Six years ago, her family moved to Fayetteville, where her father is an obstetrician/gynecologist affiliated with St. Joseph's Hospital. She plans to become a physician.